This week seems to be "dress up prepared foods" week. On Monday I beefed up bottled marinara and last night I dressed up Citarella's Turkey Chili. When you're a challenged cook, or even a good cook who is tired after a day's work, there's nothing wrong with adding your own touches to prepared foods to make them seem more like home made. Last night's dinner was no exception. I love Citarella's packaged turkey chili, but I like to add to it so it's a complete meal. Here's what I did: I put a bowl of the chili in the microwave and heated for 4 minutes. When it was done I took about a half cup of Birds Eye frozen peas, put them in a microwave safe bowl with two tablespoon of water and heated for about 30 seconds. When they were done I put them on top of the chili, added about a tablespoon of banana peppers from a jar, and microwaved for 20 seconds. This way it was a complete meal and looked and tasted great. You know me and lemon - I squeezed half a lemon on top and put the lemon on top and chopped some spring onions for a nice presentation. I was really hungry last night. Usually a half of the container of the chili fills me up, but not last night. Instead of just blindly finishing off the entire container, I put about half in a smaller bowl, again with the peas and hot peppers. This way it looked like a full serving and I didn't stuff myself with food I really didn't need or want. For the lucky residents of the Upper West Side, Hurricane Irene only amounted to a heavy rain storm. The New Jersey Shore and Long Island didn't get off as easily. There was massive flooding, trees down and many residents lost their power - some are still in the dark. On Sunday day two of making the most of my haul from the West Side Market was underway. I had purchased some hero brioche rolls and made tuna sandwiches. I used low fat mayonaisse, extra virgin olive oil, champagne vinegar and I spiced things up with banana peppers (from a jar) and some fresh basil that I found in my vegetable crisper in the fridge - I bought it the previous weekend at the Farmers Market but I salvaged a few leaves. I got the Bumble Bee tuna packed in water. I'd rather control the amount of oil going in and, besides, it tastes much better fresh. After lunch Hubbell and I were getting a bit stir crazy so we took a walk along Riverside Park. The picture above really doesn't capture the scene. It's rare that there are white caps in the Hudson River. The tug boat and ferry boat in the picture were being tossed about as if they were toys. Hubbell was a trooper even though walking in the wind was an uphill battle! For dinner I grabbed the bottle of Lydia Bastianch's marinara. I dressed it up a bit by chopping fresh garlic and grilling it in a touch of extra virgin olive oil. First I grilled cherry tomatoes and after they started to carmelize, I added the garlic and after a minute or two tossed in fresh squeezed lemon juice, a bit of Tabasco sauce and a sprinkling of red pepper flakes to give it a kick. Next, I emptied the bottle of marinara into the pan. Lydia's marinara is good straight out of the bottle but it's fun to add touches to make the sauce your own. There are turkey meatballs as well - I'll post that recipes for the meatballs and my own marinara in the near future. Drain water from can of tuna - open can and press down firmly with the can upside down. Remove lid and discard. Pre-heat non-stick frying pan (I use my trusty Le Creuset). Carefully add oil and allow to heat for a minute or so. Add sliced cherry tomatoes and cook stirring frequently until they start to carmelize. As garlic starts to brown, add lemon juice, red pepper flakes, Tabasco, salt and pepper - stir the mixture for approximately 30 seconds. Add the jar of marinara and salt and pepper. Mix well and heat until marinara starts to bubble. Turn off heat, cover and allow to sit. Ideally you will prepare this earlier in the day and let it sit on the stovetop until you're ready to boil the fussilli - or your pasta of choice. Add the prepared turkey meatballs so all the flavors can marry throughout the afternoon. As pasta is boiling I re-heat the marinara. If you make a large amount, reserve some in a separate bowl. 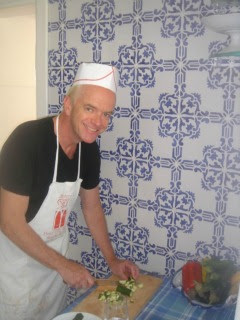 Using a spider drain the fussilli and add right into the pay with remaining marinara - mix well and serve. I grate parmasan at the last minute and give it another stir. You may want to add more parmasan after you transfer mixture to bowl. Since I've been in the habit of shopping each day for that evening's dinner, I was caught off guard when Hurricane Irene came to town. All of the markets started to get jammed with customers starting on Friday afternoon. I had dinner out on Friday night at Café Luxembourg so I was covered for that night but the weekend was another matter. I even tried shopping on the way home from dinner but there were still lines around the block - even at 11 PM! I woked up early on Saturday morning and went shopping at 6:30 AM. The good news is that there were no lines. The bad news is that the shelves were practically stripped bare. This was West Side Market and I don't trust their fish. But I found a bottle of Lydia Bastianich's marinara and I found a whole organic chicken which knew would be good for a couple of meals. I also bought some cold cuts, a few cans of tuna in water and bottled water. Trussing is not my forté but I managed! Intially I thought I'd just cover the chicken in barbecue sauce and roast it, but then I remembered a delicous recipe from Chef Bobo. The recipe calls for you to sautée the chicken in a frying pan. Before yousautée the chicken you dry it off - I used plenty of paper towels. Next, you season the bird. The market was completely out of my usual standbys like chopped rosemary, basil and tyme. All I had in the fridge was garlic and lemons. I put plenty of salt and pepper in the cavity and on the outside. I cut up a lemon and put it in the cavity. Next, I took a garlic mincer and had at it. The garlic was very large and fresh and I minced the garlic into a paste. I added a little extra virgin olive oil and salt and pepper. I put the minced garlic under the skin, making sure that it didn't rip. Next you truss the chicken by putting the wings under the bird and tying the legs and wings tightly to the body. Cover the skin with the extra virgin olive oil. You don't want too much oil in the pan. Note the 1/4 oil is for the bird, the garlic and the pan. Next you put the trussed chicken in a pre-heated pan with extra virgin olive oil and a pat of butter. Brown on all sides - be sure to get the sides as the dark meat takes longer to cook. All you're doing is browning. You will finish off the chicken in the oven. Here's the finished product after it comes out of the oven. After grilling on the stovetop roast in a 350 degree oven for 30 - 40 minutes. When you sautee on the stovetop first it creates a golden crust and seals in the juices. Here's the finished producted. I had some broccoli in the fridge and some tomatoes which I roasted along with the chicken. The pan juices made a delicious gravy. And there was plenty left over for Sunday night dinner. I'll post more about the hurricane weekend tomorrow. Thanks to Chef Bobo for the delicious recipe!